The End of Everything - Curious? Modern humans originated in Africa about 200,000 years ago. Since then, we've gone on to inhabit every single corner of the globe. But this is just temporary. The vast majority of every species that has ever lived on Earth is now extinct. To think that humans can avoid the fate of every other creature is arrogant. Like all life on Earth, our time is limited. How long will we last? There are many natural and man made disasters that could wipe us out. From an asteroid strike to worldwide pandemic; global warming to a nearby supernova detonation – there are many ways we could go. Perhaps we'll wrap it up in a mass extinction event, such as the one that killed the dinosaurs 65 million years ago, or "the Great Dying", 251 million years ago that killed 70% of land species and 96% of all marine species. Perhaps another species (intelligent cockroaches, rats) will evolve, and out compete with us in our niche. Or maybe we'll engineer our robotic replacements. There's no way to know, but there's a calculation that can help. It's called the Doomsday Argument, developed in 1983 by astrophysicist Brandon Carter. According to Carter, if you assume that half of the humans who will ever live have already been born, you get approximately 60 billion people. If you assume that another 60 billion are yet to be born, our high population levels only give us another 9,000 years or so. Or more precisely, there's a 95% chance that humanity will have ended by the year 11,000. That's a long time, but not long enough to appreciate the future the Universe has in store for itself. We thank the Sun for giving us energy. Without it, there'd be no life on Earth. It's ironic, then, that the Sun will eventually kill all life on Earth. That's because the Sun is slowly heating up. One of the most fascinating books about this topic is The Life and Death of Planet Earth by Peter Ward and Donald Brownlee. In their book, they chronicle how Sun's energy output is slowly increasing. In as soon as 500 million years, temperatures on Earth will rise to the point that most of the world will be a desert. The largest creatures won't be able to survive anywhere but the relatively cooler poles. Over the course of the next few billion years, evolution will seem to go reverse. The largest organisms and least heat tolerant animals will die out, leaving hardy insects and bacteria. Finally, it'll be so hot on the surface of the Earth that the oceans will boil away. There'll be no place to hide from the terrible temperatures. Only the organisms that live deep underground will survive, as they have already for billions of years. As mentioned above, we exist because of the Sun's good graces. But as our star nears the end of its lifetime, it'll take our planet out as it goes; one way or another. In approximately 5 billion years from now, the Sun will begin the final stage of its life, consuming the last of its hydrogen fuel supply. At that point, gravity will force the Sun to collapse, and only a small amount of hydrogen will remain in a shell wrapped around the star's core. It will then expand into a red giant star, consuming each of the inner planets: first Mercury, then Venus, and finally encompassing even the orbit of Earth. There is a controversy about whether or not a red giant Sun will actually burn up the Earth. In some scenarios, the change in the Sun's density as it expands causes the Earth to spiral out away from the Sun, keeping out of reach. In another scenario, the Sun's outer envelope will enclose the Earth. The additional friction will slow the Earth down, causing it to spiral down into the Sun. When the Sun becomes a red giant, that's only the beginning of the end. With the end of its hydrogen, the Sun will have switched to fusing helium, then carbon, and finally oxygen. At that point, our Sun will lack the gravity to continue the fusion process. It will shut down, and shed its outside layers to form a planetary nebula, such as the ring nebula we can see in the night sky. It'll then settle down to live out the rest of its days as a white dwarf. It will still retain most of its mass, but have a size no larger than the Earth's diameter. Once yellow-hot with the heat of fusion, the Sun will slowly cool down over time. Eventually, its temperature will match the background temperature of the Universe and it will become a cold black dwarf – an inert chunk of matter floating in the darkness of space. Even the oldest white dwarfs still radiate at several thousand degrees Kelvin, so the Universe hasn't been around long enough for black dwarfs to exist.. yet. But give the Sun another 1 trillion years or so, and it should finally become a cold black dwarf. Even though the Sun will have burned out billions of years from now, the planets that weren't consumed will remain. Perhaps even Earth will join that group. 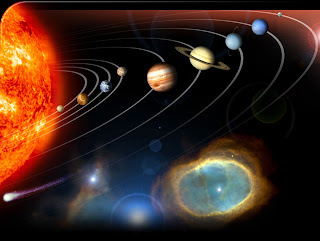 Certainly Jupiter, Saturn, the rest of the outer planets and the Kuiper belt objects will remain orbiting for eons. 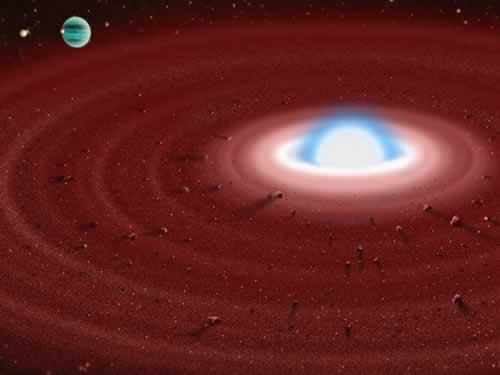 A recently discovery, published in the journal Science, reported that astronomers had discovered a disk of rapidly rotating metallic material orbiting a white dwarf. Researchers built a simulation where they put hypothetical planets in orbit around a dying star, and found that the star's death wreaked havoc on the stability of a star system. Changes in the mass of a star causes planets to collide, and rearrange their orbits. Some spiral into their star, while others are ejected into interstellar space. It's handy, but there's a problem. That mysterious dark energy force, which is accelerating the expansion of the Universe is making the most distant galaxies move faster and faster away from us. Eventually, they will cross an event horizon and appear to be moving away from us faster than the speed of light. At this point, any light emitted by the galaxy will cease to reach us. Any galaxy that crosses this horizon will fade away from view, until its last photon reaches us. All galaxies will disappear from view forever. And so, 3 trillion years from now, there won't be any trace of the Big Bang. No clues for future cosmologists to recognize that the Universe we live in started from a single point, and has been expanding ever since. The Universe will seem static and unchanging. Our future merger partner is barreling towards us right now: Andromeda. In approximately 2 billion years from now, our two galaxies will collide, and then pull apart. Then they'll collide again and again until they settle down into a new, larger galaxy: Milkomedia. The twin supermassive black holes will orbit one another, and eventually merge together into an even more massive black hole. Our position in the galaxy will change; we'll probably be pushed out to the outer reaches of the galaxy's halo – at least 100,000 light years from the centre. Since the Sun will still have billions of years left, some future form of life on Earth might be around to watch these events unfold. That's not the end of the galaxy, though. It will still be an island in space, with stars orbiting a central core. Over a long period of time, though, estimated to be between 1019 1020 years. The galaxy will erode, with all the stars escaping into intergalactic space. One day there won't be newly forming stars at all. And then one day, the last star will use up the last of its hydrogen fuel, become a red giant and then fade away to a white dwarf. Even the dimmest stars, the cool red dwarfs will use up their fuel – although, it might taken another 10 trillion years or so. They too will turn into black dwarfs. But even if matter escapes this fate, it's doomed eventually. Some theories of physics predict that protons are unstable over long periods of time. They just can't last. Any matter that wasn't consumed by a black hole will start to decay. The protons will turn into radiation, leaving a fine mist of electrons, positrons, neutrinos and radiation to spread out into space. 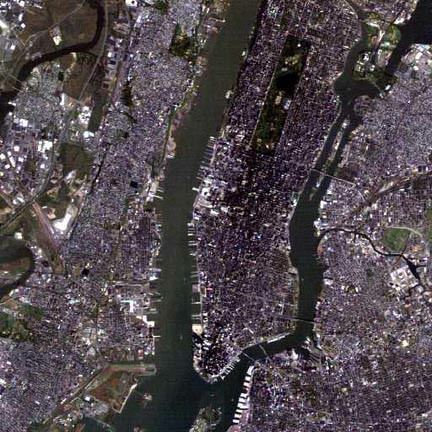 Black holes were thought to be one-way streets. Matter goes in, but it doesn't come out. But famed astrophysicist Stephen Hawking turned that concept on its head with his theory that black holes can evaporate. It's not much, and it's not fast, but black holes release a tiny amount of radiation back into space. As it releases this radiation, the black hole actually loses mass, finally evaporating away entirely. The amount of radiation increases as the black hole loses mass. It's actually possible that it could generate a final burst of X-rays and gamma rays as it disappears completely. Future observers (who survived their protons decaying) might see the occasional flash in an otherwise dark universe. Dark energy may play some future role, continuing the expansion of the Universe, accelerating each of these elementary particles and photons away from each other until they're effectively cut off from one another. No future gravity will bring them together again. Perhaps it won't, and this bleak future of a cold, dead Universe is all that awaits us. It's not happy, but it's awe inspiring to consider the long future ahead, and helps us appreciate the vibrant age we live in today.